Opt for a soft, romantic feel with dual textured gowns. Natalia’s Avignon gown by Watters features a lacy leaf bodice cinched with a delicate pink grosgrain ribbon that flows into a soft tulle skirt. 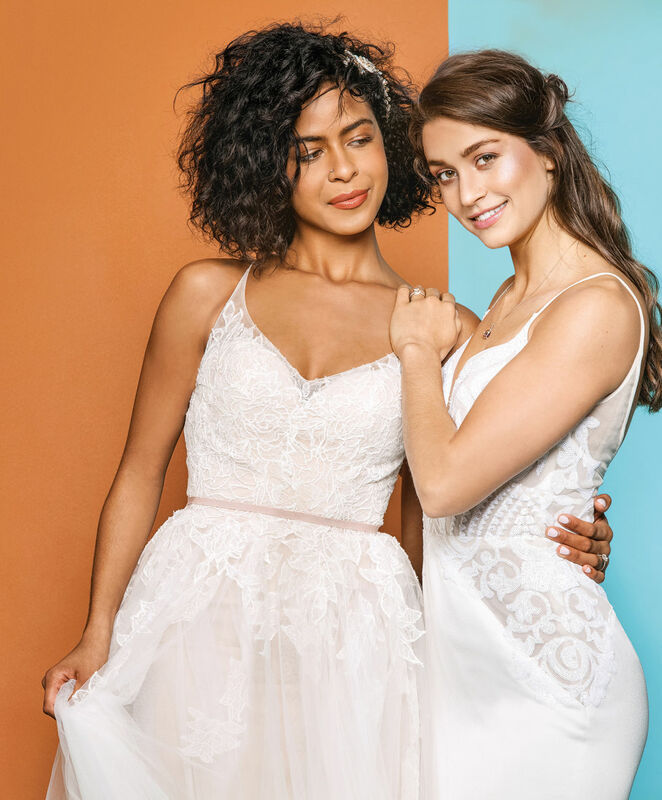 To her right, Frances’s fitted crêpe Xenia dress from Blush by Hayley Paige, turns up the dial on details with corset cut-outs and gorgeous white beading. Round out the look with the Opulence Twisting diamond ring and a cushion-cut amethyst pendant, both from Blue Nile. Ready to dance the night away? Because this Jenny Yoo sparkle Regan gown certainly is. Delicate hand-beaded strings swish and sway underneath the illusion neckline. All that jazz means you can go easy on the accessories with a single Elizabeth Bower Rose Garden hair band to finish the look. Make sure the groom’s look is equally fun, with this slick Samuelsohn charcoal wool two-button suit and Ermenegildo Zegna tie from Marios. When your personal mantra is all about individuality, don’t be afraid to combine aesthetics for everyone to get what they want. 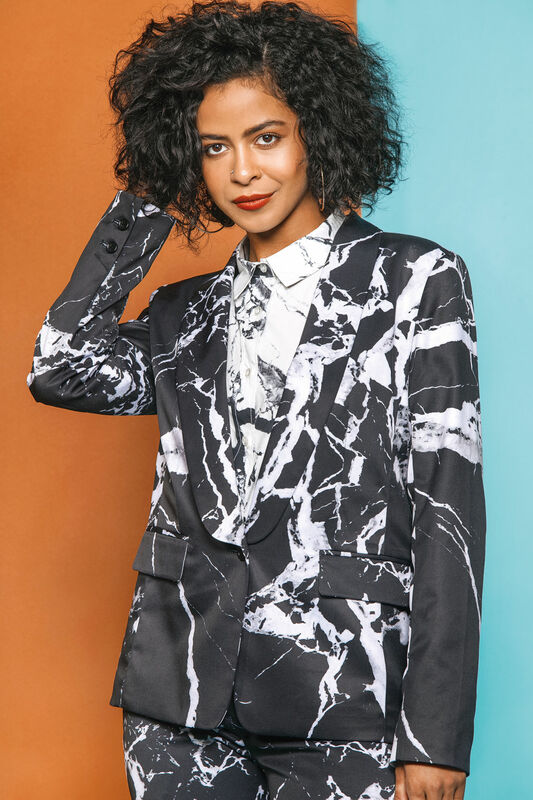 Natalia sports a vintage- inspired pavé ring from Blue Nile to go with her bold black-and-white marble Wildfang suit with an inverted button-up for an extra pop. The perfect counterpoint to this fearless tux? A luxurious silk crêpe gown with dreamy tiered, off-the-shoulder sleeves, Gilded Petal gold drop earrings from Elizabeth Bower, and Floating Halo diamond and rose-gold ring from Blue Nile. Beyond those magical sleeves, the Petra gown by Elizabeth Dye has a softly draped train and covered buttons up the center of the back. Thinking outdoor wedding? There’s one key word to making that alfresco affair feel fancy: texture. For the fellas, consider a seersucker or woven silk blend, like this Seattle Blue suit from Marios paired with a traditional Eton slim white dress shirt. For the gals, think elegant embroidery or three-dimensional lace, like Jenny Yoo’s Riley gown with a floral motif running down the plunging neckline to the high-low hemline. Why walk down the aisle when you can rock down the aisle? Not for the faint of heart, the Dallas jumpsuit from Claire La Faye is a precision fit—from the silk spaghetti straps down to the wide lace leg. But if you really want to make it a show, consider Claire La Faye’s silk-lined, rooster and ostrich Dakota cape for the pièce de résistance. Because if there was ever a time for a full feather cape, today’s the day. 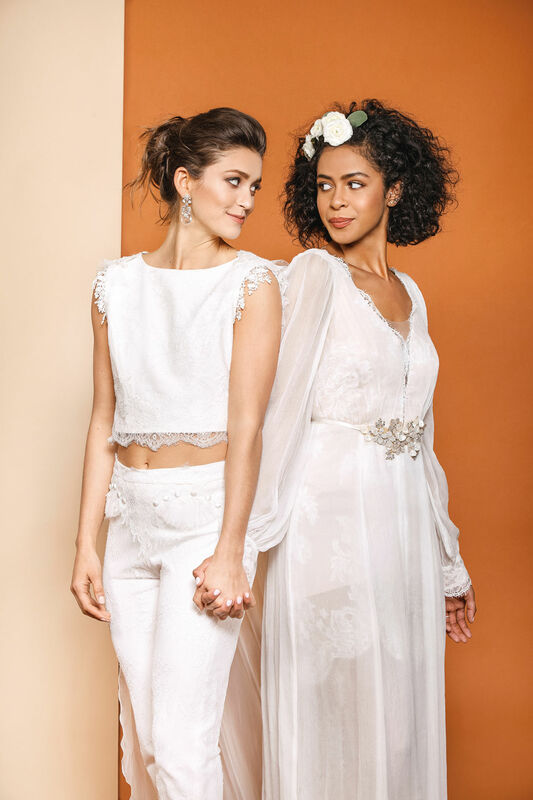 Sassy and sweet make a perfect pair, thanks to these designs’ deft use of lace. Frances drops the traditional pantsuit in favor of Claire La Faye’s Jude lace and silk crêpe crop top with sheer lace back, paired with the tailored Royal pant and Elizabeth Bower Sakura dew drop earrings. Natalia wears Twigs & Honey’s ethereal layered silk Petunia gown with floaty Bishop sleeves, a scoop back, and train.